Alert .....Alert .....Lawyers from around the world must help their Iranian colleagues released from prison immediately before they perish in the Islamic Republic jails ! 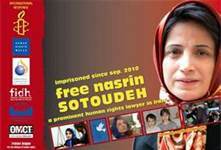 Nasrin Sotoudeh the Iranian women's and children's rights lawyer & a human rights defender's life is in great danger. 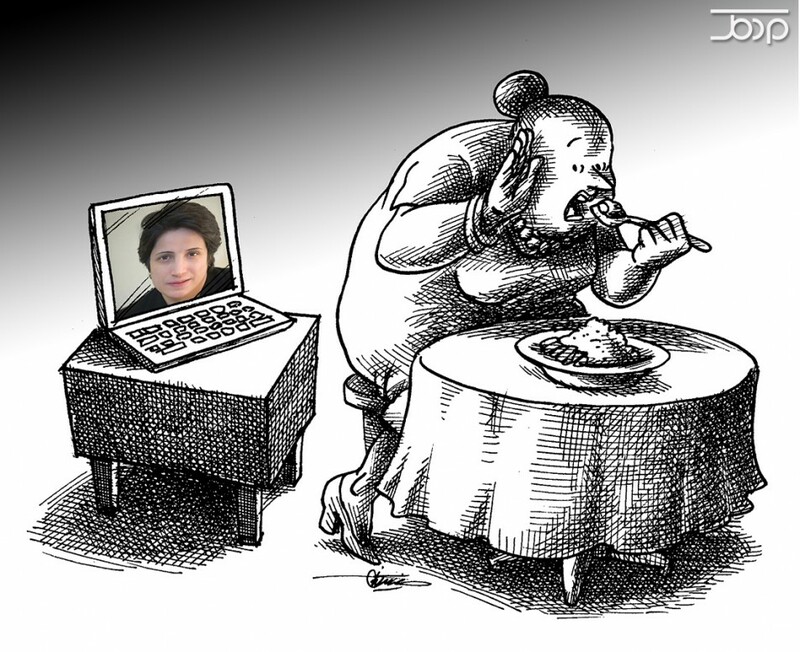 Nasrin Sotoudeh on her 42rd days of Hunger Strike ! Lawyers from around the world , please help your Iranian colleagues released from prison. Iranian imprisoned lawyers and human rights defenders are in prison for a long time already. They are going to perish one by one in the Islamic Republic's jails. According to news , Nasrin Sotoudeh's husband Mr. Reza Khandan warned about the danger threatening Nasrin's life in prison.He said: Nasrin's blood pressure was too low and she was admitted to prison clinic and her situation have reached to a new dangerous level . 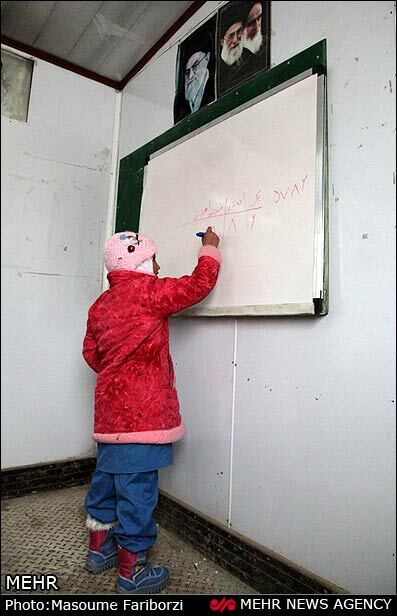 Nasrin husband added : "Nasrin's only demand is that ,regime to let her daughter travel abroad, she says; why the government punishes her 12 years old child instead of mother." 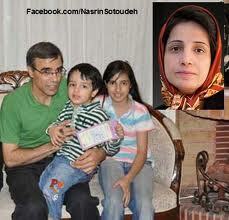 Islamic regime in Iran earlier banned Nasrin's daughter and husbands' travel abroad. Nasrin Sotoudeh and......are the three prominent Iranian lawyer and human rights defenders who are in prison and their lives are in great danger . (November 27, 2012) The International Campaign for Human Rights in Iran welcomes today’s passage of a resolution by the United Nations Third Committee of the General Assembly calling on the government of Iran to stop its massive human rights violations. The resolution passed with 83 votes in favor, 31 against, and 68 abstentions. “This is a very important resolution in support of the Iranian people and is the least the international community can do in the face of the ongoing human rights crisis,” said Hadi Ghaemi, the Campaign’s spokesperson. Iran’s ambassador to the UN, Mohammad Khazaee speaks at the UN prior to the vote. Although he attempted to discredit the resolution as “politically motivated,” His own lengthy speech was primarily a political statement and did not address any details of the human rights crisis in Iran. “The Iranian human rights community is under tremendous duress, as we can see since lawyer Nasrin Sotoudeh remains imprisoned for defending human rights activists, blogger Sattar Beheshti died during interrogations earlier this month, political prisoners still face severe prison conditions after unfair trials, and executions continue to skyrocket,” Ghaemi added. Today’s resolution enjoyed broad cross-regional support, including that of Latin American and Caribbean countries. Barbados, Guatemala, Paraguay, and St. Kitts and Nevis all changed their votes to yes this year. The majority of Latin American states, including Argentina, Chile, El Salvador, Honduras, and Mexico, along with all members of the European Union, voted yes. Turkey again refrained from voting altogether. The positive votes included Libya, Japan, Bosnia and Herzegovina, and Colombia, as well as South Korea, Senegal, and Central African Republic. The Brazilian representative gave an explanation of his country’s abstention, noting Brazil does not condone nor ignore the human rights violations in Iran, but believes securing Iran’s cooperation is urgently needed. 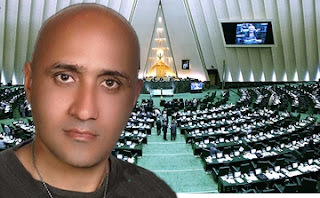 Regarding the treatment of prisoners, the resolution pressed the Iranian government on its violations of due process and of the rights of detainees, including, among several other issues, “the denial of access to medical treatment as well as persistent reports of detainees dying in custody,” as in the death last month of blogger Sattar Beheshti , or the deteriorating health of imprisoned journalist Ahmad Zeidabadi. The resolution also highlighted the “continuing alarming high frequency in the carrying out of the death penalty in the absence of internationally recognized safeguards,” as well as the continued practice of public executions and secret group executions. Today’s passage of the resolution marks the ninth consecutive year the General Assembly has cited Iran’s dramatic failure to abide by its human rights obligations and urged cooperation with UN authorities to address these failures. 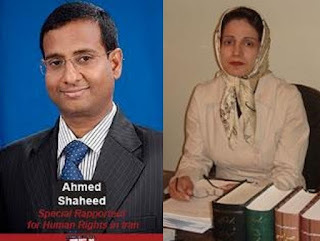 The resolution again called for cooperation with Special Rapporteur on the situation of human rights in Iran Ahmad Shaheed, who has not yet been allowed to enter the country even though he is now several months into the second year of his mandate. In recent years, Iran has continued to thwart all international efforts to assist in improving its human rights record. Prior to the vote, Iran’s ambassador to the UN Mohammad Khazaee gave a lengthy speech impugning Canada, which submitted the draft resolution, and many of the countries which co-sponsored it. He insisted that the resolution had “more than 150 unsubstantiated allegations” against Iran, but refused to identify them. Instead, Khazaee used his speech to accuse the resolution’s co-sponsors of political motives against Iran. The Campaign welcomes the wide-reaching, cross-regional and global support for the resolution and urges Iran to cooperate with the United Nations to address the concerns it raises. The UN General Assembly will adopt the resolution formally in December. Azadi Square, Tehran- Three years ago June 2009, people protest against election cheating in Iran ! 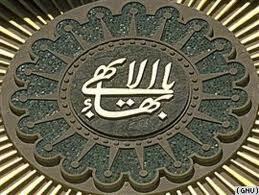 More Iranian Bahai's are arrested in Iran! 1- According to news more Iranian Bahai's from the city of Mashhad are arrested, detained and sentenced by Judge Ghorbani to imprisonment. Fataneh Hajipour,Navid Nabili,Ezatollah Ahmadian,Negin Ahmadian,Hourieh Mohseni,Arman Mokhtari,Shayan Tafazoli, Behnaz Hadadzadeh,Shahzad Khalili,Naghmeh Zabihian,Negar Malekzadeh. 2- The Ministry of Guidance ordered for the closure of "Maqreb" Newspaper.The reason for the closure is said to be the publication of " Insulting subjects " .!!!????? Maqreb newspaper published a caricature showing Ahmadinejad tearing papers ,seems standing in parliament podium and laughing at MP's and the title at the front page of newspaper which reads: "End of question" . MP's were planning to question Ahmadinejad in the parliament on his failed economic & political policies , but Khamenei the leader asked the MP's to end the questioning !!!!????? 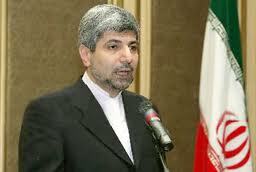 And the MP's followed Khamenei's order and ended the call for Ahmadinejad to come to the parliament for questioning. Bashar Asad of Syria and wife ,New look !!!???? When i look at this picture , i say definitely this wasn't their look few years ago . Before the uprising in Syria , they looked more happier and there was life and energy in them , but what about now ? Look at them !? What are they afraid of ? What is in their mind ? Is it about their destiny , their future? or thinking what happened to Qadafi or Ben Ali , Mubarak ...and it might happen to them and their family one day? definitely they have less trust now to the people around them!? and their circle is getting smaller . The unfit ,corrupt and coward leaders of Middle East including Saudi Arabia and Iran .........could not become like Mandela and Gandhi to empower their nation & country, to do nation building, and therefore face their failed past and future uncertainty for themselves and for their children.The worst yet to come to Saudi Arabian kings & families and Persian Gulf States corrupt kingdoms. Time has changed and young generation think not as followers but as deconstructionists of past mentalities. 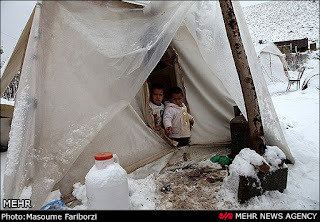 Islamic Regime in Iran and New Situation ! News: Office of Jebheh Meli ( National Front) in a statement today reported on the ambush of tens of security forces of the Islamic regime to the home of Eisa Khan Hatami and others in the city of Esfarayen and Sabzevar and arrested , blind folded and detained Its members ,those arrested are : koroush Zaim ,Eisa Khan Hatami , Mohammad Oveisi and Mohsen Rahami .The report says ,those arrested and detained were kept several hours in detention and later released. It seems Islamic Regime in Iran has began new round of attack on dissent banned political party's.just in this week, two banned political party members( Pan Iranist party & Jebheh Meli or National Front ) were ambushed in the city of Karaj and Esfarayen - Khorasan and were arrested and detained. In the Islamic Republic ,all political dissent party's are banned of any activities or else they face persecution. Perhaps for the coming of presidential election in June next year and fear of people uprising ,like the one in 2009 which lasted almost a year and made the ruling despot to take steps to crack down again these members. Is these attacks on political party's an unorganized attack or a new trend by the Islamic Republic to pacify the dissent voices by threatening them and their family members with death, imprisonment and destruction of their lives? While the differences among the ruling officials deepening which forced Khamenei for time and time to speak to them to end their differences, but despite of those warning shots , the confrontation is rising to a new level, for example between Ahmadinejad ( Government officials,some of the security & ministry of information forces including plain cloths,Jebheh Paydari , ayatollah Mesbah Yazdi's followers and some members of parliament ) in one side and Ayatollah Rafsanjani now a moderate and his followers,Ali Larijani speaker of the parliament and Sadegh Larijani head of judiciary power and reformists including ex-president Khatami ,Musavi & Karoubi ( the leaders of green movement and.....). There seems no end to this differences and division in the Islamic Republic as the growing unrest reaching to a new level of eruption . This coming 6-7 months until mid June is very crucial for the regime of the Islamic Republic and of course for Iranian people . from now we will hear more arrest and attack again on banned political party members, workers unions ,teachers union , human rights advocates and activist, student movements and their leaders , women organizations and ....Time is also running out for the Islamic regime for a failed system of governing. I would like to first of all offer my thanks to the governments of Germany, Sweden, and Norway for unconditionally accepting my request to conduct my latest fact-finding mission in their countries. The mission has been very successful, as I was able to collect a wealth of valuable information on subjects relevant to my mandate in Berlin, Stockholm, and Oslo. Over the past twelve days, I have met and spoken with several dozen individuals of Iranian origin, human rights workers, government officials, and academic experts. I would like to thank everyone who took time to share information with me, particularly those who were able and willing to offer first-hand witness testimony related to the situation of human rights in Iran. I have and will continue to apply rigorous standards in assessing the credibility of every individual account and piece of testimony I encounter. With that said, the credible testimonies I did receive on this trip have largely confirmed patterns I had previously encountered, and paint a very concerning picture of the human rights situation in Iran. I speak at a time when the execution rate in Iran seems to have accelerated to an alarming pace in recent weeks and months. There are credible reports, in many cases corroborated by the government itself, that the number of executions carried out in just the past two weeks is at least 32, and possibly as high as 81. In October, the government executed 10 individuals, including Mr. Saeed Sedighi, despite impassioned calls from the international community to halt the executions in light of serious concerns regarding due process. 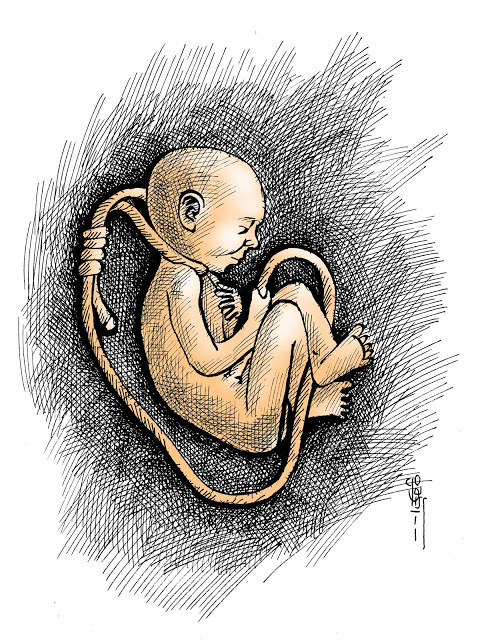 I am extremely alarmed by this apparent spike in executions, and I reiterate my call on the government of Iran to adhere to its own international legal obligations in guaranteeing due process and ceasing the use of the capital punishment, except in cases narrowly defined as acceptable by the UN Human Rights Committee for the ICCPR. I am troubled by the treatment of various minority groups in the country, who all too often bear the brunt of repressive policies. These include unrecognized religious minorities like the Baha’i and Yarsan, as well as recognized but increasingly suppressed religious communities like Christians and certain Sunni Muslim communities. I am also deeply concerned about ethnic minorities, including the Baluch, Kurdish, Ahwazi Arab, Turkmen, and Azerbaijani peoples, whose plights are often compounded by linguistic and cultural subjugation, in additional to political repression. The situation for women in Iran has worsened in recent months, as new segregationist education policies have been implemented, and women’s rights activists are being harassed and sometimes arrested for various forms of free expression, including for the defense of women’s rights or for educational or cultural expression. A new bill, currently in the Parliament, would extend the age required for women to obtain the consent of a parental guardian for a passport to 40. The situation for sexual minorities in Iran is also extremely alarming, as the government tightly controls all forms of consensual relations. The Iranian government continues to harass, detain, and imprison human rights defenders, who are often themselves lawyers, raising serious concerns about the independence of lawyers and of the judiciary in the country. While I was pleased that the government released Pastor Youcef Nadarkhani in September, I was disappointed that only days later, authorities summoned his lawyer, Mohammad Ali Dadkhah, to serve a prison sentence for spurious charges. Ms. Nasrin Sotoudeh, another lawyer and human rights defender currently in prison, is on a hunger strike related to the authorities’ treatment of her family, and I am worried about her condition. 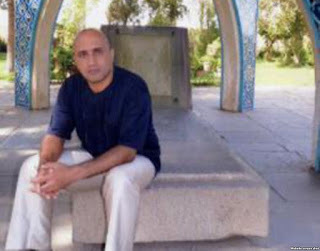 Of course, I am extremely troubled by reports that Mr. Sattar Beheshti, a blogger imprisoned for exercising his legitimate right to free expression, died while in custody, possibly because of injuries sustained from torture. I expect the Iranian government to conduct a comprehensive, impartial, and transparent investigation into his death, to make the methodology and results of that investigation public, and to punish anyone responsible and compensate his family appropriately. I also once again extend this call for investigations to cases dealt with by previous mandate holders, and to the events following the 2009 presidential elections. In this regard I echo the concluding observations made by the Human Rights Committee in their review of Iran last year. Iranian government authorities do not approve of, for any reason, in contravention of Iran’s international legal obligations and, indeed, some of its own laws. I remain hopeful that the government of Iran will substantively engage the specific findings that I have outlined today, and in more detail in my reports, and that we can work together to reverse these trends and promote respect for human rights, freedom, and rule of law. I would now be happy to answer any questions you might have. Nasrin Sotoudeh the imprisoned Iranian lawyer ,women & children's rights defenders on her 39th day of hunger strike and her daughter ( Mehrave's ) 13th birthday ! 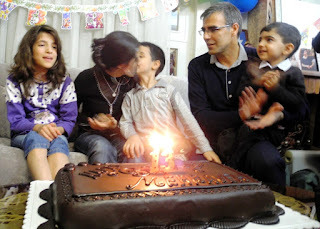 Nasrin Sotoudeh on her 39th day of hunger strike ,absent in her daughters 13th birthday party ! 10 Pan-Iranist party members are arrested in the city of Karaj ! Even the most toughest police state can't save the despotic Islamic regime in Iran ! Islamic regime will crumble and the despots will be brought to justice ! According to news, on the evening of Thursday Nov.22,2012 the security forces of the Islamic regime in Iran, in an ambush on Engineer Reza kermani's home in the city of Karaj, have arrested 10 Pan- Iranist party members.There are no news on their whereabouts. Hojat Kalashi,Ojan Akbari,Hossein Shahryari ,Kasra Alasvand,Alireza Soleymani,Homan Eskandari and Farhad baghbani . IRAN WATCH CANADA - War in Gaza: Some celebrate ,some mourn ! Where is the justice ? (Jerusalem, November 23, 2012) – Israel and Hamas should follow the announced ceasefire agreement with concrete measures to address longstanding human rights abuses and the impunity that has fueled violations in successive conflicts, Human Rights Watch said today. Their allies should press the parties to address ongoing abuses as well as laws-of-war violations during the current conflict, which killed dozens of civilians. Media reports quoted the agreement’s provisions as obliging Israel and Palestinian forces to stop all attacks, and Israel to open the crossings it controls into Gaza and to “facilitate the movement of people and the transfer of goods” and to lift restrictions on Gaza residents’ internal freedom of movement, including by “not attempting to harm persons in the border area” near Israel. The Associated Press reported on November 21 that Hamas officials said the details on the new border arrangements had not yet been negotiated. Some Palestinian armed groups launched as many as 12 rockets in the first few hours after the ceasefire went into effect, according to media reports quoting Israeli police officials. Israel should end measures that harm Gaza’s civilians in violation of international law, Human Rights Watch said, including a blanket ban on travel to the West Bank, and firing live ammunition to restrict Palestinians’ access to up to 35 percent of Gaza’s farmland and 80 percent of its fishing waters. In conjunction with Egypt’s continued closure of Gaza’s southern border to the import and export of goods, first imposed by the prior Mubarak government, Israel has also imposed a blockade that – while partially eased since June 2010 – continues to restrict the import of construction materials and the export of goods, harming Gaza’s economy. Around 44 percent of Gaza’s residents cannot afford adequate food, the United Nations Office for the Coordination of Humanitarian Affairs (OCHA) reported in July 2012. “The ceasefire agreement’s provisions on easing restrictions on movement and the transfer of non-military goods reflect the immense harm that the blockade has imposed on Gaza’s population,” Stork said. Since November 14, Palestinian armed groups have launched approximately 1,500 rockets towards population centers in Israel, the Israeli government stated. Rockets killed three Israeli civilians and wounded 219 others, including at least three seriously, according to OCHA and media reports, while a mortar shell fired from Gaza killed a fourth Israeli civilian. Launching rockets that cannot distinguish civilians from military targets, or deliberately launching rockets at or otherwise targeting civilians, are serious violations of the laws of war. From November 14 to noon on November 21, Israeli aerial and artillery attacks killed at least 90 Palestinian civilians in Gaza, including 26 children and 12 women, OCHA reported. The Gaza Health Ministry reported at 10 p.m. on November 21 that those wounded included 381 children under age 17, including 119 under age 5, as well as 186 women, and 88 people older than 60. Israeli attacks on presumptively civilian structures, including media buildings, civilian government buildings and police stations, raise concerns that the laws of war were violated; civilian objects may not be attacked unless and for only such time as they are being used for military purposes. Human Rights Watch is investigating attacks by Israeli forces and Palestinian armed groups. Ending existing hardships to Gaza’s population by lifting all restrictions on non-military commerce and travel should be a ceasefire priority, Human Rights Watch said. 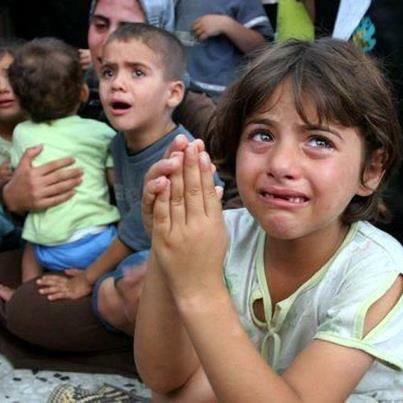 Israel in May 2010 began to ease the blockade it imposed on Gaza from 2007 to 2010; it no longer, for instance, limits the amount of food imported into Gaza based on calculations of what is minimally necessary to avoid malnutrition. But Israel, in conjunction with Egypt, continues to block virtually all exports from Gaza, hampering the re-development of its crippled economy, and prolonging an impoverishing and debilitating status quo for Gaza’s 1.7 million residents. Israel bans almost all Palestinians whom it has registered as Gaza residents from traveling, much less moving to the West Bank, where many have close relatives and other ties. Egypt has eased restrictions on the movement of Palestinians across the southern Gaza border, but has until now continued to require Palestinians to present Israeli-approved identification documents. This combination of policies effectively prevents most Gaza residents from traveling anywhere in the world without Israeli authorization. Although the smuggling tunnels beneath Gaza’s southern border continue to flourish, Egypt has continued to restrict almost any imports or exports through the Rafah border crossing. The cease-fire agreement, which Egypt helped broker, provides a good occasion for Egypt to end its history of imposing harmful restrictions on trade and the right to travel of Gaza’s residents. The Israeli military has also denied Gaza farmers access to 35 percent of the territory’s agricultural land by firing live ammunition to warn away, or in some cases kill, anyone who comes within 500 meters of the boundary fence; in some areas the restrictions extend to 1500 meters. The Israeli navy has repeatedly shot at, swamped or seized Palestinian fishing boats that venture more than three nautical miles from shore, barring access to fisheries in some 85 percent of Gaza’s territorial waters. The authorities in Israel and Gaza should end impunity for laws-of-war violations and avoid a repeat of the December 2008 to January 2009 Gaza conflict, in which neither Israel nor Hamas provided meaningful accountability for abuses, Human Rights Watch said. During “Operation Cast Lead,” Israeli attacks killed hundreds of Palestinian civilians, including in attacks that violated the laws of war, and unlawfully destroyed hundreds of civilian buildings without military necessity. Israel convicted only four soldiers for crimes. Only two received prison time, a soldier sentenced to seven months for stealing a credit card, and another who took a 45-day sentence as a plea bargain after being prosecuted but not convicted of a fatal shooting of a Palestinian woman and her daughter, who was holding a white flag. Hamas and armed groups in Gaza unlawfully fired hundreds of rockets at Israeli population centers during the 2008-2009 conflict, killing three Israeli civilians and injuring dozens. Hamas has prosecuted no one. Armed groups in Gaza, including Hamas’s military wing, the Qassam Brigades, also carried out 32 extrajudicial executions of alleged collaborators with Israel during the conflict and in the three months afterwards. The Qassam Brigades have claimed responsibility for seven more such killings since November 15, 2012. In addition, the bombing of a bus in Tel Aviv on November 21 was a deliberate attack on civilians. According to the Israeli emergency medical service, Magen David Adom, the attack wounded 17 civilians, one critically, three of whom required surgery. The failure of Israel and Hamas to hold perpetrators of serious international crimes to account could fuel future abuses, as it has in the past, Human Rights Watch said. The United States, instead of shielding its Israeli ally from international pressure to end the virtual impunity for members of its armed forces, should press for real accountability. Hamas’s supporters, including Egypt, Qatar and Turkey, should press it to end attacks directed at Israeli civilians and to hold members of its forces accountable for abuses. The Islamic regime in Iran spends Iranian peoples Oil money in helping Hamas,Hizbullah , Asad of Syria and.....but not to its own people of Azarbayejan - Azarbayjan is the coldest region in Iran - the region was hit by earthquake on August this year , but until now the people live in Tents - This film is taken by Iranian citizen journalists- film discloses the terrible situation of people after earthquake and regime continue to ignore them . 1- Representative from Ministry of Information met Parastoo Frouhar daughter of Darioush & Parvaneh Frouhar ( Both murdered by security agents of the Islamic Republic in Chain murdering case 14 years ago) ,warned and threatened her not to hold anniversary commemoration for her parents. The Ministries representative said, if she does ,the security agents will confront with participants. 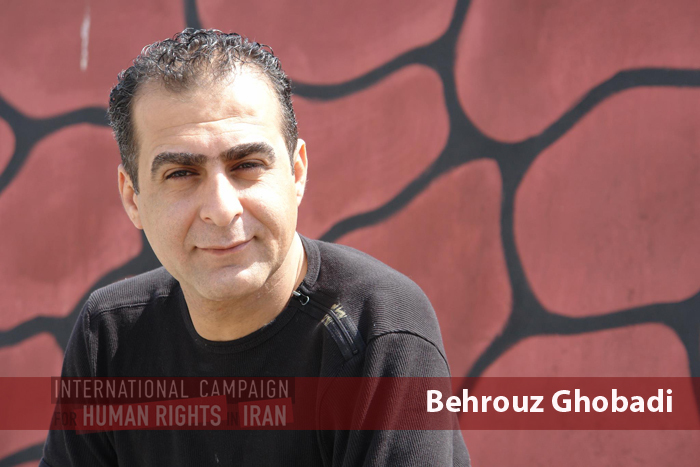 2- Hostage taking ....Behrouz Ghobadi is arrested ! Security forces of the Islamic regime have arrested Bahman Ghobadi's brother and his family members have no idea on his whereabouts. Bahman Ghobadi an international award winning film maker and a critic to the Islamic Regime in Iran speaking with an Iranian human rights organization asked regime to let his brother contact his family and let him to get a lawyer to defend him. He said ; his brother is arrested on Saturday Nov.4,2012. 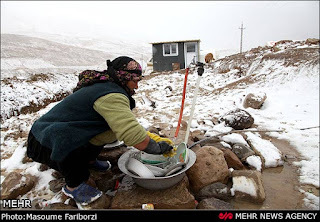 Bahman Ghobadi lives outside Iran . 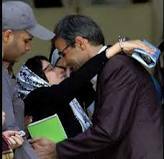 3- Hostage Taking continues .....Masoumeh Dehghan , abdolfatah Soltani's wife is sentenced to one year imprisonment and five years ban from leaving to country.the sentencing is handed on Nov.17,2012. 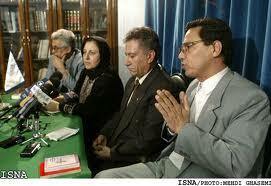 Abdolfatah Soltani is the brave Iranian lawyer and a co-founder of "Iran Association of Human Rights Defenders " . He is sentenced to 13 years imprisonment and currently serving the sentence in exile in the city of Borazjan 1200 km far from his family . 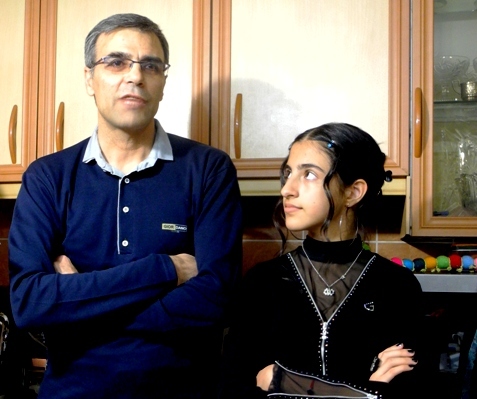 two of the Bahai faith arrested are Saman and Ashkan Badpehei Arni ,they are from the city of Karaj .They were arrested two weeks ago and one of the brother had contacted the family after seven days detention but there is no news from other brother . The other Bahai arrested is from the city of Gorgan and his name is Farhad Eghbali . Farhad is arrested on Tuesday Nov.20. It must be added that on Oct.17,2012 also security agents in an ambush arrested 17 other Bahai's in the city of Gorgan. There is no end to persecution and arrest of Iranian Bahai Faith by this Apartheid regime. On Sunday Nov.18 regime security forces also arrested three Bahai's and their names are: Siamak sadri, Payam Markazi and Fovad Fahandej ,all of them were arrested in their homes. 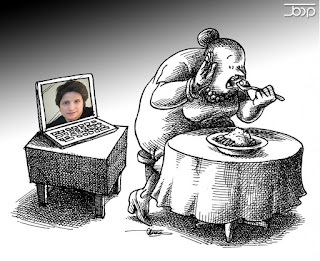 More on the situation of Nasrin Sotoudeh the Iranian lawyer and human rights defender ! 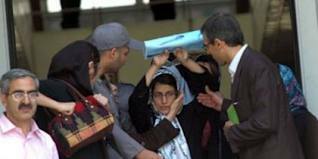 According to Nasrin Sotoudeh's husband Mr. Reza Khandan , she supposed to spend 20 days in solitary confinement in ward 209 of Evin prison ,which will end on Wednesday Nov.21,2012. She spend 18 months in prison without using the phone. 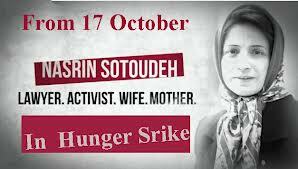 She started hunger strike since Wednesday Oct.17,2012 in protest to her situation in prison. The prison official sent her in solitary confinement since Oct.31st . Nasrin Sotoudeh was arrested on September 2010 .
she was sentenced to 11 years imprisonment ,20 years ban from practicing law and 20 year ban from leaving the country .But later the appeal court dropped the sentencing to six years and 10 years ban from practicing the law. On Monday Nov.12 the children were able to see their mom in prison for a few minutes. She lost weight. 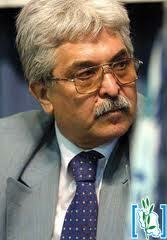 Prastoo Frouhars' passport is confiscated at the airport in Iran! Prastoo Frouhar is the daughter of late Darioush Frouhar and Parvaneh Frouhar who were savagely killed at their home by security forces of the Islamic Republic in Iran ( The case of Chain murdering - this case is still open for investigation ). 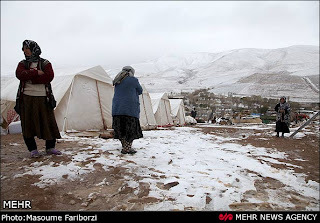 Every Year Parastoo returns home to commemorate the anniversary of the killing of her parents and the Islamic regime in Iran warned her not to hold any event ( as the case of previous years ).And every time she returns,the security forces threatens her in various ways which all aims to silence her. On Saturday when she returned to Iran, her passport was confiscated by security forces of the Islamic regime and a summon was given to her and was asked to attend at the security office on Nov.27 ,2012 , she said in an interview. 27 Iranian Kurdish political prisoners lives are in great danger . They are all sentenced to death by this Islamic judiciary system !??!!! Save the lives of these 27 Kurdish Iranian ! In regard to theses Kurdish political prisoners ,11 Eastern Kurdistan organizations in a statement asked people to join them on November 17 a day of resistance against Islamic regime and support these political prisoners and save their lives. 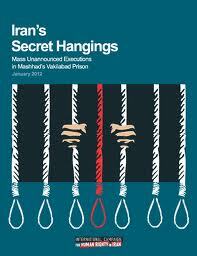 The tragic lives of Iranian political prisoners and dissidents under Islamic regime !! Nasrin Sotoudeh on her 26th days of hunger strike ! 1- Nasrin Sotoudeh the brave imprisoned Iranian lawyer and a human rights defender is on her 26th day of hunger strike and still being denied the rights to see her children by judiciary,security officials and prison officials in Iran.Reza Khandan ,Nasrin's husband on her facebook wrote : "On Sunday after a call by prosecutors office ,i had an hour to be at prosecutors office ,i had to get Mehraveh ( daughter) from school and Nima ( son) from home -who had could. They have kept us three hours behind prison door and one hour after the closure of the prison, we returned home without visitation." This is what they do daily on all political prisoners family members and they enjoy doing so, a bunch of sick people running Iran, what else can i say. 2- The human rights office of the Islamic Republic finally reacted on the tragic death of Satar Beheshti, the 35 years old Iranian who was arrested at his home in Robat Karim district,detained by security forces and one week later, prison officials told the family to go and get the lifeless body of Satar. "the determination of the judiciary power to pursue on the death of a citizen in prison." the result will soon be delivered to the public by judiciary spokesperson." The closure of Iranian Lawyers Association!!!!! 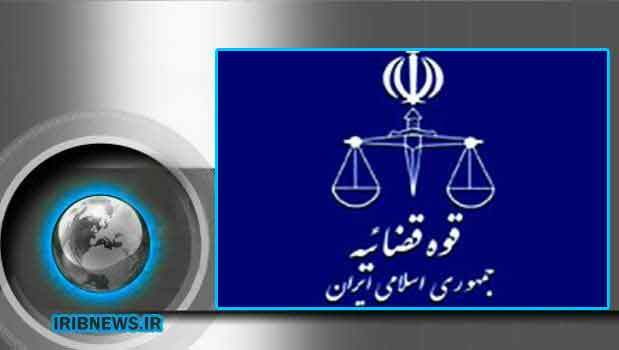 Islamic regime in Iran ordered for the closure of Iranian Lawyers Association. This was happening because the Association demanded the judiciary power not to interfere into the Association's election. The Lawyers Association was established 58 years ago and has 22 branches all over Iran and it is an independent - non Governmental organization .Under this regime all independent organizations like " The Association of Human Rights Defenders, The Union of Iranian Teachers , The union of Iranian Nurses or the Association of Medical Practitioners and......all are closed and many prominent lawyer including Nasrin Sotoudeh are arrested and detained.The latest news indicated that Nasrin Sotoudeh Iranian Lawyer is on her 24th days of hunger strike in Evin prison. Tragic death of Satar beheshti an Iranian blogger ,arrested ,detained and was killed by security forces brought national anger toward the current rulers (particularly , Khamenei and Mohammad Sadegh Larijani head of judiciary ) ! 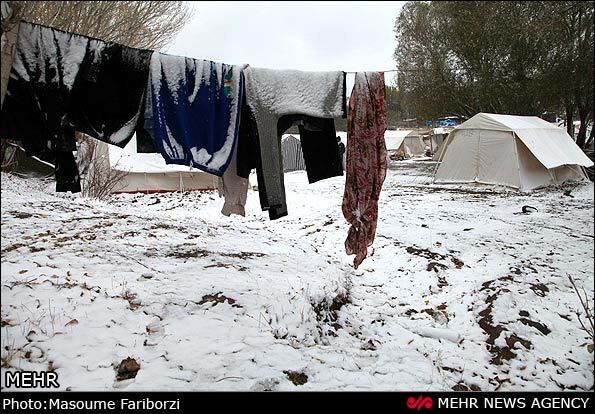 Where is Javad Larijani the head of Human Rights Commission of the Islamic Republic ? Why he is keeping his head under the sand and keeping silence ?! while an MP brings this issue in the parliament?!! In recent days news about tragic death of Satar beheshti the Iranian blogger is on all news papers and websites or blog sphere.The papers and websites inside Iran also wrote article about Satar beheshti's tragic death by security forces of the Islamic regime in Iran and an MP ( Tavakoli) requested from Majles ( Parliament) to look into the death of Satar beheshti. Masih alinejad's blog ( An Iranian journalist living in England) prepared recorded voice of Satar Beheshti at the end of the segment where you can hear.The first part: she speaks with a police official ,who denies of hearing any news about the tragic death. The second part : she speaks with Satar's sister and the third segment is the voice of Satar himself, who says : "I'm not afraid of being arrested and detained or even hanged ,but i'm worry about my mom, she tells me, you better leave the country.This was happening because; several time security forces came to my house and took away my notes and other belonging and threatened me." (Beirut, November 10, 2012) – Iranian authorities should investigate the death of a 35-year-old blogger in custody and immediately provide his family with information about the circumstances of his death, Human Rights Watch said today. Initial reports suggest that he may have died from ill-treatment or torture. 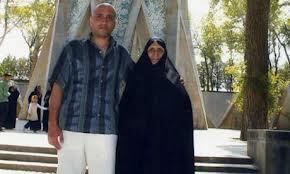 The blogger, Sattar Beheshti was arrested by Iran’s cyberpolice on October 30, 2012, when they raided his mother’s home in Robat Karim, 25 kilometers outside of Tehran. The police confiscated a number of his personal belongings, including his computer. The police unit, also known as “FATA,” was established in January 2011 to enforce laws aimed at regulating online speech and content considered to violate Iran’s national security or moral legislation. People who spoke to the family told Human Rights Watch that the family tried to get information about Beheshti’s whereabouts and the reason for his arrest from security and judicial officials, but that they heard nothing until November 6, 2012, when police officials told the family he had died in custody. The exact circumstances and cause of death are not known at this point, and the authorities have not publicly accepted any responsibility for Beheshti’s death. His death brings to at least 15 the number of people detained for exercising their basic rights who have since 2009 died in custody or as a result of injuries during their detention from alleged mistreatment or neglect. Human Rights Watch has compiled information from witnesses, family members, and other sources suggesting that at least 13 of them died as a result of physical abuse or torture. No high-ranking officials have been brought to justice for any of these deaths. According to a report on BBC Persian, authorities buried him in Robat Karim, his hometown, but allowed only his brother-in-law to attend the funeral. 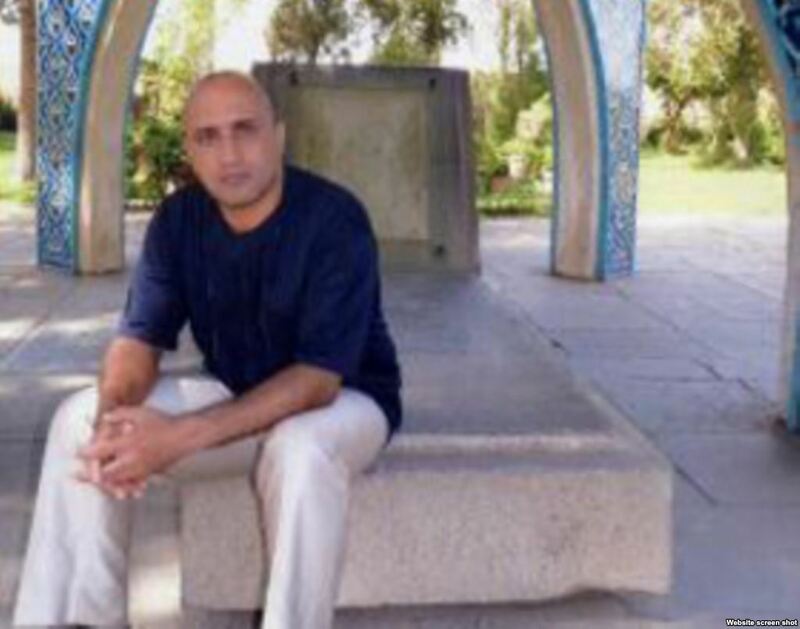 A source close to the family told Human Rights Watch that after the family gave interviews to opposition websites about Beheshti’s death, the authorities have put tremendous pressure on the family to stop. On November 6, 2012, reports surfaced on several opposition sites, including Kaleme andSaham News, both of which are close to opposition figures, that witnesses inside Ward 350 of Evin prison, where many political prisoners are held, had seen Beheshti with injuries on his arms, legs, and face. 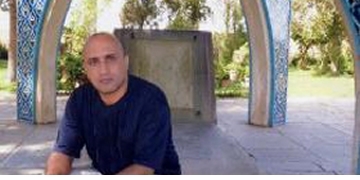 The unconfirmed reports said that Beheshti had been injured during his arrest and interrogation. The reports indicated that Beheshti’s family, including his ailing mother, became extremely worried about his health and tried to get information about his condition from Evin and other officials without success. On November 8 Kaleme reproduced a copy of a letter allegedly written bv Beheshti in which he protested his ill-treatment at the hands of Tehran’s cyberpolice. The letter says the police threatened and beat him during interrogation sessions for two days. “I hold [the cyberpolice] responsible for anything that happens to me, and declare that any confessions taken from me were extracted under torture, which I was subjected to during my 12 hours in room 2 of Ward 350 [of Evin prison],” the letter was quoted as saying. Human Rights Watch has not been able to independently verify the authenticity of the letter. In an October 29 blog attributed to Beheshti called “Criticism,” the author said he had recently been threatened over his blogging activities: “Yesterday they threatened me [and said] tell your mother she will soon have to don a black shroud because you refuse to shut your big mouth.” The author, without identifying who is threatening him, wrote that his harassers threatened to do whatever they wanted to him until and unless he stopped writing, but that he would not stay silent. Human Rights Watch has not been able to independently verify the authenticity of the blog post. Officials had previously arrested Beheshti for his criticism of the government during student protests that took place in Tehran during July 2003. Since 2009, Human Rights Watch has documented numerous cases of ill-treatment, torture, or medical neglect of detainees, some of which led to deaths. On March 6, 2009, Amir Hossein Heshmat Saran, a 49-year-old prisoner at Rajai Shahr prison outside of Tehran, died at the Rajayi Shahr public hospital in Karaj. It was not clear whether Saran died as a result of mistreatment or medical neglect. On March 18 of the same year Omidreza Mirsayafi, a blogger, died in a hospital, authorities said, after doctors diagnosed him with very low blood pressure and transferred him to the prison infirmary. According to reports at the time, his family said he bore signs of ill-treatment, including a broken skull and bruises on his body. 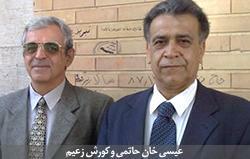 Three detainees – Amir Javadifar, Mohammad Kamrani, and Mohsen Ruholamini – died in July 2009 at Kahrizak detention facility outside of Tehran, which was operated by Iran’s police forces and housed protesters who participated in anti-government demonstrations after the disputed 2009 presidential election and the violent government crackdown that followed. 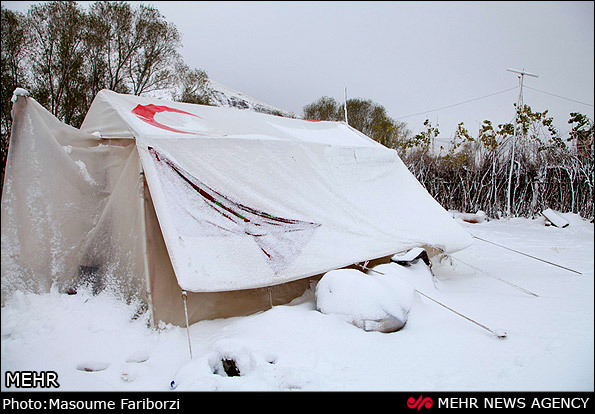 In 2010, the victims’ families and rights activists reported that two other detainees,Ramin Aghazadeh Ghahremani and Abbas Nejati-Kargar, died after their release from the facility, due, they said, to injuries suffered in custody there. Authorities have denied that their deaths are linked injuries at Kahrizak. In December 2009, a military court charged 11 police officers and a private citizen who allegedly collaborated with the police with murder over the deaths at Kahrizak. 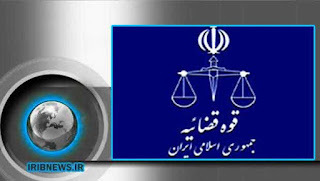 On June 30, 2010, Iranian media reported that the military court convicted and sentenced two of the defendants to death, fines, lashings, and monetary compensation to the victims’ families. Nine others received undisclosed prison sentences and fines, according to media reports. But the court acquitted the highest-ranking defendant, General Azizollah Rajabzadeh, who headed Tehran’s police force at the time, of all charges. No other high-ranking security or police officials implicated in the deaths were ever put on trial or brought to justice. According to Ahwazi Arab rights activists, at least another six detainees have been torturedto death in the custody of security and intelligence forces in connection with anti-government demonstrations that swept across Khuzestan province in April 2011 and again in April 2012. 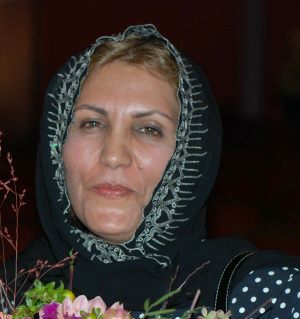 Hoda Saber, a journalist and political activist who was serving a prison sentence in Ward 350 of Evin prison, died on June 10, 2011, at a Tehran hospital after a hunger strike to protest the death of another political activist who died after security forces attacked her during her father’s funeral. On the eighth day of his hunger strike prison officials transferred Saber to the prison infirmary with chest and stomach pains. The International Campaign for Human Rights in Iran reported that security officials posing as medical personnel severely beat Saber in the infirmary, and later failed to transfer him to the hospital in a timely matter after he had a heart attack. International and Iranian law require prison authorities to provide detainees with adequate medical care. Iran’s State Prison Organization regulations state that, if necessary, detainees must be transferred to a hospital outside the prison facility. The United Nations Standard Minimum Rules for the Treatment of Prisoners require authorities to transfer prisoners needing specialist treatment to specialized institutions, including civilian hospitals. Both Iranian law and international law require prison authorities to provide basic necessities to all prisoners and to treat them with dignity and respect. The International Covenant on Civil and Political Rights, to which Iran is a state party, prohibits inhuman or degrading treatment or punishment. (Los Angeles, November 7, 2012) – California voters’ failure to abolish the death penalty perpetuates a barbaric practice and places the state out of step with national trends, Human Rights Watch said today. Had it passed on November 6, 2012, Proposition 34, the SAFE (Savings, Accountability, and Full Enforcement for) California Act, would have closed down the nation’s largest death row. The 724 people on California’s death row are more than 20 percent of the death row inmates in theUnited States. Under the SAFE Act, their death sentences would have been vacated and they would have been resentenced to life without parole. The proposition failed by approximately 5 percentage points. Human Rights Watch opposes capital punishment in all cases. Government-sponsored execution is inherently cruel, and its application has been plagued with prejudice and error. In the US, 141 people have been released from death row after presenting evidence of their innocence, three of them in California. African Americans are more likely to be sentenced to death than whites, and defendants are much more likely to be sentenced to death when the victim is white. Many of the arguments surrounding the SAFE Act revolved around the costs of the death penalty – California has executed 13 people since 1992 at a cost of approximately $4 billion. The act would have set aside $30 million of the money saved by doing away with the need for costly death penalty appeals and death row housing and devoted those funds to investigating serious unsolved crimes. Almost half of California’s homicides go unsolved, as do a majority of the rapes reported in the state. Between 2007 and 2011, the US ranked behind only China, Iran, Saudi Arabia, and Iraq in number of death sentences handed down. There has been a heartening trend away from the death penalty in the last five years, however, Human Rights Watch said. Of the 17 states that have rejected the death penalty, 5 have done so since 2007 – New Jersey, New York, New Mexico, Illinois, and Connecticut. Nationally, the number of executions has been declining since 2009. Even the disappointing failure of voters to pass the SAFE Act revealed some reason to hope. Over 800,000 Californians signed the petition to place the initiative on the ballot, and an unprecedented coalition, including district attorneys and corrections officers, endorsed the measure. Countries around the world have increasingly rejected the death penalty. Of the 193 United Nations member states, 94 have laws abolishing the sentence, while 137 are abolitionist in practice. 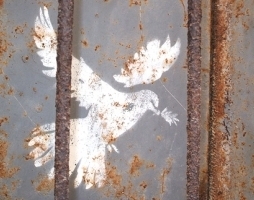 According to the UN Secretary General, 175 countries were execution-free in 2011. Belarus is the only European country that still applies the death penalty. Satar beheshti an imprisoned worker died under torture in Evin prison ! An innocent Iranian workers life is taken away by Islamic regime in Iran again, while in prison and as a captive . Khamenei and Mohammad sadegh Larijani ( head of judiciary power) are responsible for his death. Satar Beheshti is an imprisoned worker killed under torture in Evin prison ( according to other prisoners). The prison officials told his parents to buy a grave and come take his lifeless body. The officials ( Security forces of the Islamic regime in Iran) told his parents, you have no rights to ask question and you must shut up !The prisoner at ward 350 in Evin prison said; one night we saw his body smashed and all over his body not sound. Satar was a 35 years old worker and bread winner of the family ! Islamic regime in Iran reacted against confiscation of its Embassy and Cultural center in Canada ! Arya News Agency - Spokesperson of foreign affairs of the Islamic Republic reacted against confiscation of Iranian assets in Canada. Mehman -Parast spokesperson of the foreign affairs of the Islamic Republic said; the action of Canadian Government for confiscating Iranian assets in Canada is against principles of the UN charter and is contrary to the Vienna convention of 1961 ( diplomatic relation) and 1963 ( consulate relation) and clearly contradict with international legal regulations and the rule of law in the world. He added; There are political motive behind this action and it started right after the suspension of diplomatic relation and closure of Iran's Embassy in Canada and the Canadian courts laying their hands on the assets of Iranian people,clearly shows the motive of the Canadian Government. Mehman-Parast said; Canadian Government is responsible for the violation of International regulations and demanded the immediate stop of these trend. Obviously , Islamic Republic reserve its political and legal rights to take steps against this action, added Mehman-Parast. Freedom for all these brave Iranian political prisoners ! Nasrin sotoudeh on her 19th days of hunger strike ! Can freedom of political prisoners bring the people of Iran into the street against Islamic regime headed by Khamenei?!!! Nasrin Sotoudeh the brave Iranian civil rights lawyer and a human rights defender is on her 19th days of hunger strike. She is not only in solitary confinement but also is banned by Islamic regime in Iran headed by khamenei not to see her children. her husband Mr. Reza Khandan said, he attended at the jail to see her but told, she is not allowed to see anyone!!??? 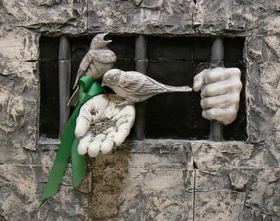 Will Iranian from all walk of life come together for the sake of "freedom for political prisoners "?? A documentary film about Iran Tribunal -42 min- Int'l Tribunal for Iran-1980s Massacre of Political Prisoners (2nd Court Hearing), Peace Palace, The Hague, Netherlands- 26th Oct. 2012, Video ! Three Weeks No visitation for Nasrin sotoudeh, Nine imprisoned women on hunger strike in Evin prison. 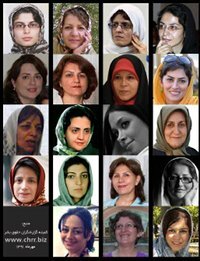 After an assault on women political prisoners in Evin prison by more than 20 prison guards and security forces,which also angered Faezeh Rafsanjani the daughter of Hashemi Rafsanjani ( A prisoner herself) , 9 well known and many of them award winning imprisoned women went on hunger strike. 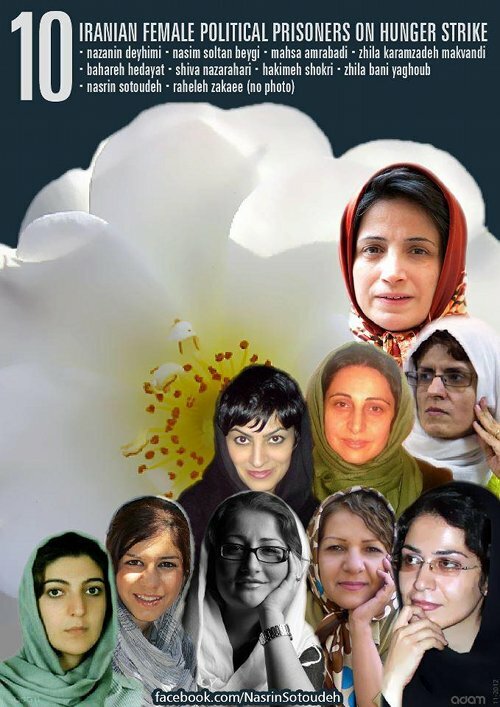 Bahareh Hedayat, Jila Baniyaqoub, Nazanin Dayhimi ,Shiva Nazarahari,Mahsa Amrabadi,Hakimeh Shokri,Jila Karamzadeh Makvandi , Nasim Soltanbeigi and Raheleh Zekaei are those imprisoned Iranian women in Evin prison who have started hunger strike in protest against the assault by security Guards and security forces on women political prisoners. the imprison Women chanted slogan inside the prison : " Ya Hossein ,Mir Hossein " ," Death to Dictator", " Long Live Mousavi & Karoubi" . 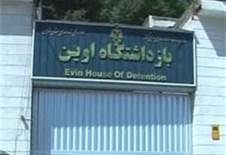 The prisoners demanded that Mr.Ali Ashraf Rashidi the newly appointed head of Evin prison to officialy apologize what his guards have done by invading the imprisoned women ward and searched and harassed them and to promise this kind of action won't happen again. Iran’s Canadian assets frozen over $13M U.S. terrorism payout ! An Ontario judge has issued a restraining order against Iran’s property in Canada — including its embassy in Ottawa and a former cultural centre in Toronto — as the family of an American woman killed in a terrorist attack tries to collect a $13-million judgment by a U.S. court from a wrongful death claim against Iran’s security agency. Three properties were frozen, ensuring they are not sold or transferred, until court can decide whether they should be forfeited to the victim’s family to help satisfy the U.S. court award. The property is owned by the government of Iran or by an “alter ego” used “as a front” for Iran, court heard. Justice Beth Allen of the Ontario Superior Court found that a case exists that Iran has title, either legally or beneficially, to the three properties, an initial success for the family of Marla Bennett. 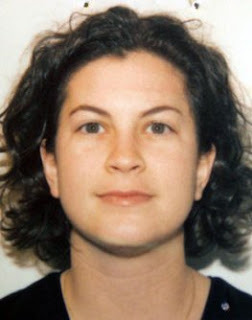 Ms. Bennett of San Diego was killed in 2002 in a bomb attack on the Hebrew University campus in Jerusalem, where she was a graduate student in Judaic studies. She was 24. A U.S. court declared Hamas responsible for the attack. Hamas is classified as a terrorist group in Canada and the U.S.
“It is undisputed that members of Hamas committed this extrajudicial killing of Marla Bennett, and indeed took credit for it,” ruled U.S. District Judge Royce C. Lamberth in 2007. Iran and the Iranian Ministry of Information and Security were ordered to pay Ms. Bennett’s parents and sister $12,904,548. Winning that case, however, was the easy part. Collecting the money has proved challenging. “The plaintiffs have not been able to enforce the U.S. Judgment against Iranian assets in the U.S.,” wrote Judge Allen. The family has turned its attention to Iran’s assets here. The Ontario court heard evidence from Thomas Fay, a U.S. attorney, that Iran aggressively protects its assets from legal seizure. “Iran declines to participate in U.S. court proceedings until enforcement efforts are made. Then Iran gets involved for the purpose of doing whatever it can to avoid enforcement,” he told court. Other financial judgments in the U.S. against Iran were followed by the removal of the assets from the country, he said. Professor Farrokh Zandi, an economics professor at York University and president of the Iranian-Canadian Congress, told court that Iran uses various ploys to evade international sanctions and seizures. Mr. Zandhi said Iran uses corporations outside Iran who do business with third-party entities in countries that have not imposed sanctions, and uses individuals and companies that do not appear to be agents of Iran. “Iran uses cultural centres to cloak the involvement of the Iranian government and government officials in promoting Iranian interests,” he told court. The unusual Ontario case has already faced difficulties. Although a motion to have the U.S. judgment recognized in Ontario was filed Sept. 13, the family’s lawyers could not serve Iranian officials because of severed diplomatic ties. Foreign Affairs Minister John Baird announced Sept. 7 he had closed Canada’s embassy in Tehran and gave Iranian diplomats five days to leave Ottawa. Lawyers for Ms. Bennett’s family were trying to serve notice to Iranian officials through Canada’s Foreign Affairs. No representative of Iran appeared at the hearing or offered submissions. An official could not be reached for comment. 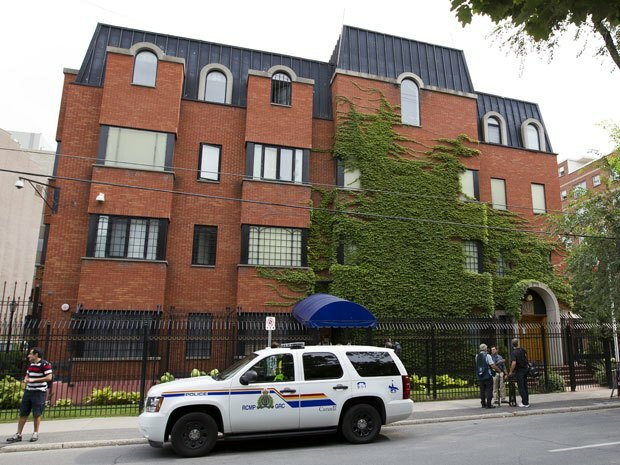 Court heard that other than the embassy, the properties were not officially listed as Iranian government property. The Toronto property is held by Farhangeiran Inc., court heard, a company with deep ties to the Iranian state. The president is Fazel Larijani, of a prominent family in Iran, court heard. Mr. Larijani was once Iran’s cultural attaché to Canada; a brother was Speaker of Iran’s Parliament, and another brother the current head of Iran’s judiciary. The building is currently available for lease for $3,590 a month. It has nine rooms and a reception and is ready to move in, says the advertisement, but Daniel Nakhlestani, its real estate agent, declined to talk about its ownership. “Someone called me asking for my services, it’s my job. I’m just a real estate agent. It is property and someone listed it and I don’t know about this,” he said when told of the court actions. He said he has not been contacted by authorities. The Robinson Avenue property is legally owned by the Mobin Foundation but at the time of its sale it was named as a government of Iran property, court heard. The findings, Judge Allen said, can be challenged when the full motion is heard. John Adair, the Toronto lawyer for the Bennett family, declined to comment while the case is pending.